1. Materials- a standard room size painters tarp (about $20), rope, paint, 1 inch paint brush and large safety pins. 2. Check desired measurements. In this case we cut the painters tarp in half, then sewed it end to end lengthwise. Turned it inside out and sewed together lengthwise creating a long sleeve. Turn it right side out so the seam is now inside the sleeve as pictured above. 3. The lettering was done with black house paint and a 1 inch brush. Smooth out the tarp and lay out the letters with a ruler, or stencils depending on your lettering skills. Paint letters. 4. When dry, thread a sturdy rope through the sleeve and hang as shown in this photo. We used large safety pins in a few places under the rope to hold it snugly in place. Other possibilities: for a faster, cheaper, easier banner, theres always butcher paper and markers. Since this was an outdoor party on a ranch and set up a week in advance, we opted for the sturdy version, and it worked out great! The streamers added a festive flare! Ribbons from every sewing project I ever had in the past, and shredded fabric makes up these colorful streamers. 2. Hang the twine on a wall or somewhere easy to work. Tie the end of the ribbon or fabric to the twine. Tie it twice and tighten, but leave loose enough to move if adjusting is necessary later. We used different lengths and colors according to what we had. 1. Decide on the size of the flag and make a template & cut as many as necessary to cover the desired area. 2. Press/iron a hem at the top of the flag & fold over a long piece of twine or anything that the sewing machine can handle. 3. Carefull stitch along the hems edge so the twine is secure. 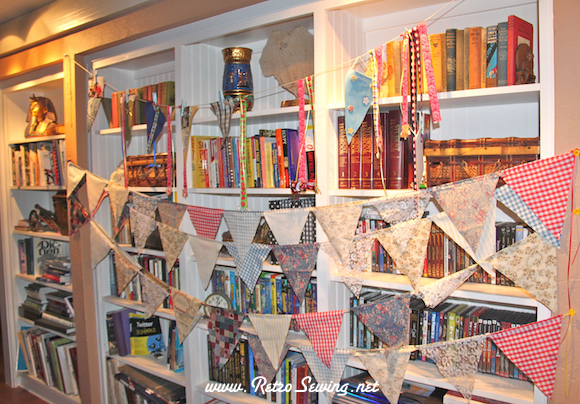 Do not stitch over the twine so you can move the flags if necessary. Also easier on the sewing machine. After cutting, pressing, stitching and hanging they'll look like this. It's fun to use scraps from all the past sewing projects over the years. These decorations were washed and pressed after the party, and then stored for next time. They can be used for many years and many parties to come. Burlap Flags with a message. 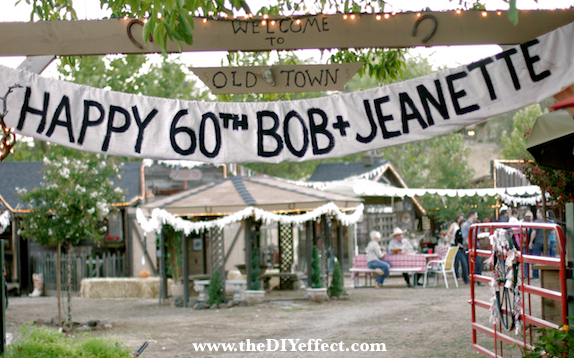 Burlap was perfect for this country party. This flag was especially large compared to the flags above. About twice the size. The lettering was done in rhinestone and was beautiful glistening in the sun, but t is not showing up in the photo, so I added letters to help this photo display the point. 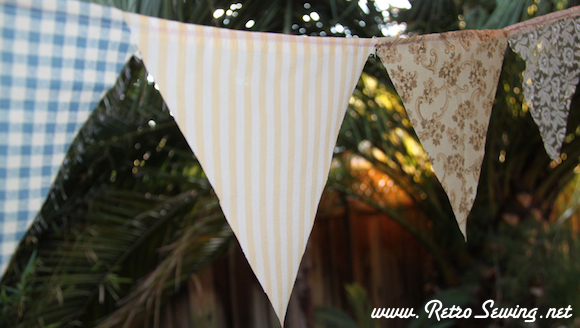 You can add anything you like to the flags.I used strips of diamonds you buy by the role at fabric or craft stores. You can use stick on letters, leaves, marker, paint, buttons, whatever works. The burlap fabric is heavy so this is a heavy banner, but also very solid and wind resistant. You can use burlap from any source you have, or buy it by the yard. 1. Materials- small scraps leftover from any project or cut up old sheets and tablecloths. 2. Tie the small pieces of fabric in a knot around a desired length of twine, heavy string or rope. Make it as thick or thin, long or short as you like. All colors or a single color. 1. Hang on ordinary nail bent upwards to help hold in place, looping twice around each nail. If windy, then consider looping a third time. 2. Allow garland to drape for a scallop, or pull tight for another look. 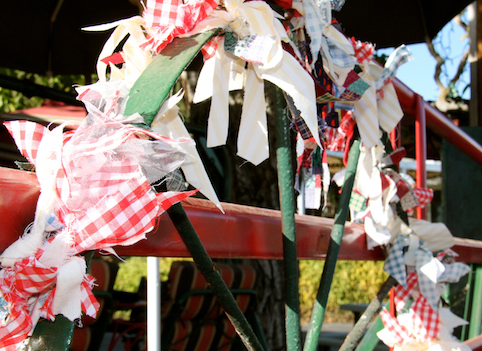 In the photo above the flags are pulled tight and the garland is scalloped. 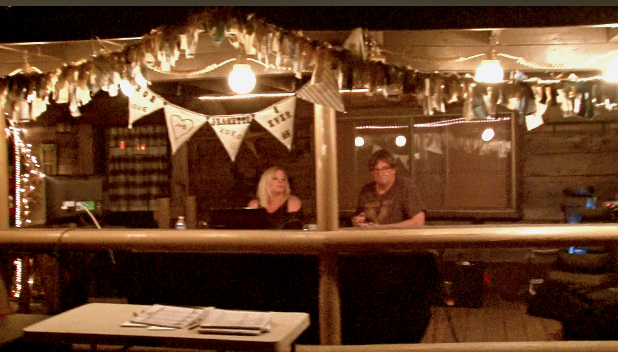 The DJ's and Karaoke stage had a great spot in the OK Coral with all the equipment and makeshift stage. They were highlighted with lights, flags and garlands. It was a great party! This is a time consuming project that can be enjoyed if you go into it with the right attitude. If you have a special occasion coming and you know about it way in advance, this could easily be done. Just keep a basket with the fabric, scissors, twine, string or rope, and whenever your hands are idle, just start making garlands. 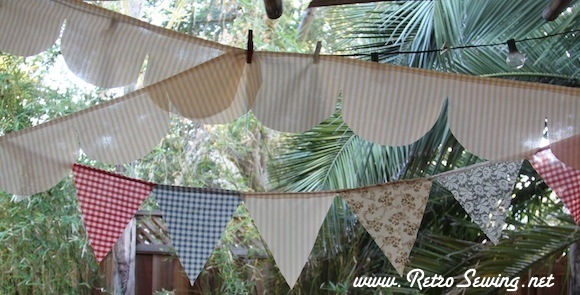 For the flags a sewing machine and iron ideal, but there are ways to do no sew flags too. 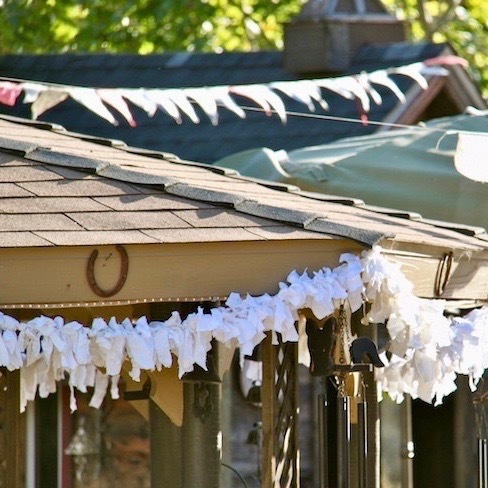 The decorations were made over months prior to the party. 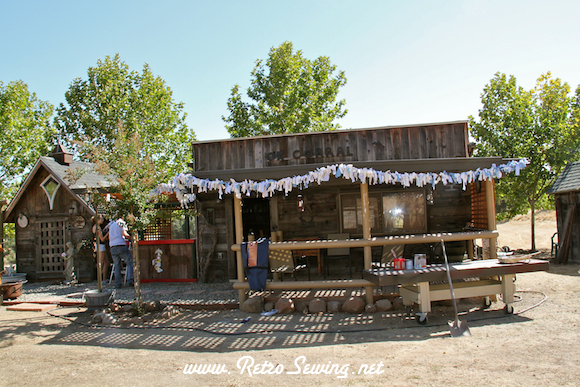 We used old sheets, pillow cases, table cloths, curtains, old clothes, underware, and even socks. Much love was put into the decorations and it showed. We will use these decorations for years to come. How I built this site!